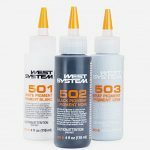 Additives Archives - Goosebay Sawmill and Lumber, Inc.
West System pigments are epoxy-based liquid colorants used to tint the epoxy mixture to provide an even color base for the final finish system. Available in white, black, and gray. 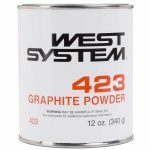 423 Graphite Powder is a fine black powder that can be mixed with epoxy to produce a low-friction exterior coating with increased scuff resistance and durability.